An automobile that evokes emotions and is synonymous with pure performance. As an owner, you know driving a Porsche is pure pleasure. With a statement of individuality and polished performance, keeping up with regular maintenance and necessary auto repair is important for your distinctive vehicle. Our professional Factory Level Trained Technicians at Baldwin’s German Autowerks in Novato, CA, recognize the intricacy and specific attention Porsches need, and have the knowledge and equipment to perform any auto repair or general maintenance service necessary for your Porsche. 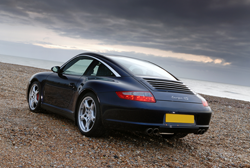 Located nearby surrounding towns of Novato, CA, including Marin County, Baldwin’s German Autowerks is just a quick drive for all Porsche auto repair and maintenance needs to keep your ultimate driving machine in perfect performance.